YOU ARE ABOUT TO VIEW MY COOP WHICH I NAMED GUSTY ACRES DUE TO THE STRONG WINDS THAT WHIP THOUGH MY PROPERTY. 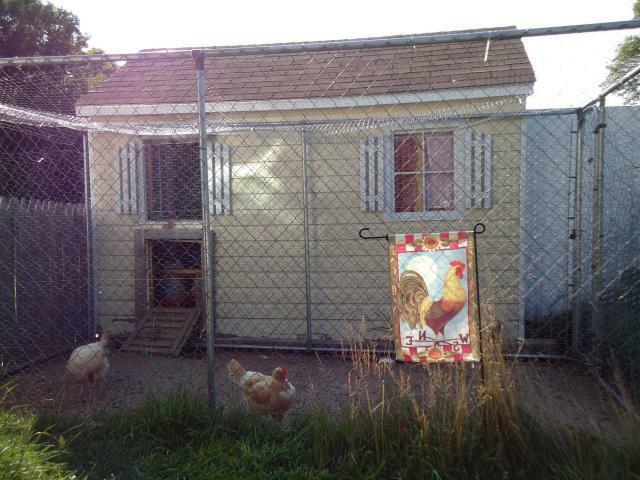 THIS COOP HAS BEEN MY OBSESSION, SUBJECT OF MOST OF MY DREAMS AND NIGHTMARES AT NIGHT, PRIDE, AND SOURCE OF COMFORT. PLEASE TAKE A MOMENT TO EXPLORE MY VERY OWN POULTRY PARADISE! The front run is 7'6" by 13' chain link fence with chicken wire on the lower part of the fence as well as over the top. 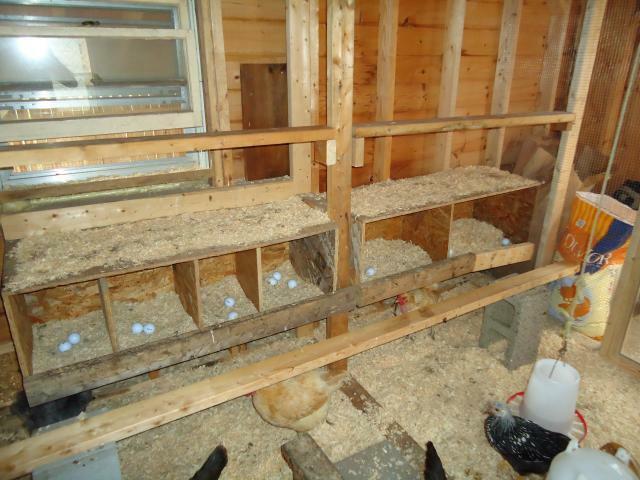 Both the coop, back and side runs can be accessed from the left side. The back run is completely sheltered. This roof has been a great help with keeping the girls cool in the summer! It also allows them to get outside during the winter. A must have for any coop in my opinion. 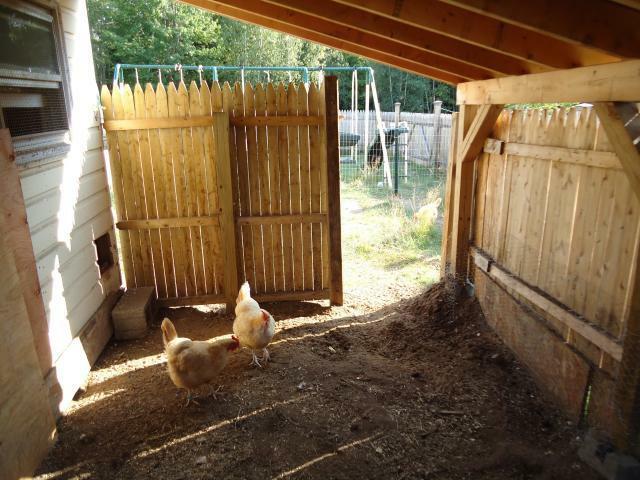 I opted for long movable roosts on either side of the coop. This gives me the freedom to change my floor plan as needed. If you look closely to the upper left of this photo you'll notice that my coop has electricity. In the winter I hook up a heated base to keep the water from freezing. I also have a light so that I can work out there at night if necessary. Nest boxes - to the right of photo is my supply "breeze way". The nest boxes are rather low to the ground enabling the girls easy access. Above the nest boxes are two more roosts. The majority of the flock sleeps on these roosts at night. I cover the top of the nest boxes with shavings. Every morning I scoop up the soiled shavings on top of the boxes and put clean shavings down. This keeps the coop nice and clean. I HATE A DIRTY COOP! It only takes a few minutes each day and I think it's well worth it. I have one last roost stretched across the very top of the coop. Only the young and lighter birds seem to be able to roost here. But the ones that do LOVE it. The supply area has been wonderful! Recently I was able to use it to keep an injured bird separated from the flock while it healed. I just cannot imagine what I would do without it! Now this is my newest addition to my coop. 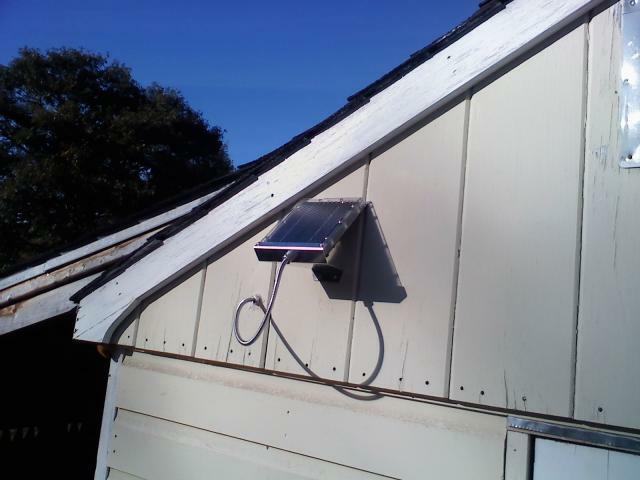 The solar panel powers my "Pullet-Shut" automatic chicken door. I was a bit nervous about the installation but it was remarkably EASY! The whole thing (panel, battery, and door) took well under an hour! Really!! 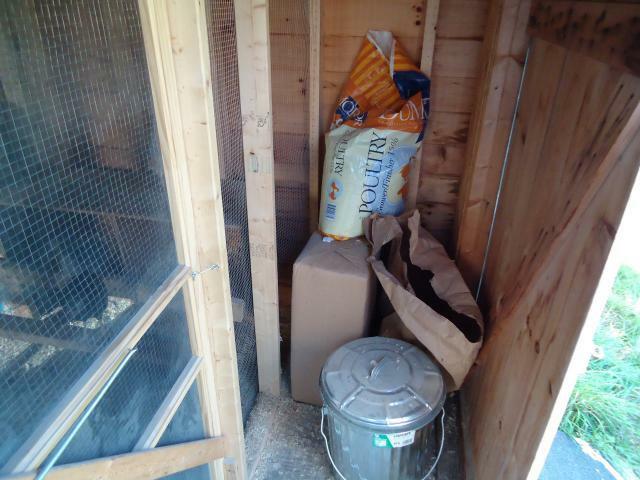 This coop is a modified 8'x 12' garden shed. I used salvage wood and I purchased some materials from Lowe's as well as Habitat for Humanity. It has taken quite some time to finally get the coop to fit my needs. Originally I used only half of the shed for a coop (when I had only a few birds). Now my flock has increased and so did my coop. 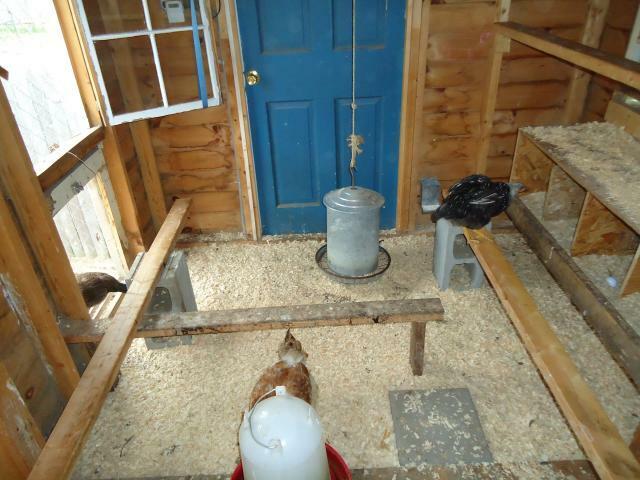 Much to the surprise of my friends and family I made the entire shed into a coop. They think it is unbelievable that I would use such a nice shed for chickens....oh well! I'm happy and so are my feathered babies. 1. The location of the coop. As I stated previously the coop was originally a shed. Therefore it is located closer to the house away from any trees. I have to be mindful of the weather in order to plan ahead for hot days. Opening some doors while covering the windows with sheets in order to control the coop's temperature. 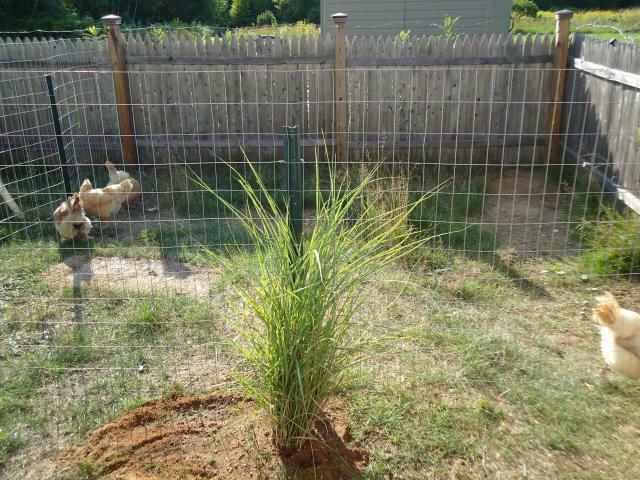 I plan on planting a couple of trees in the spring of 2011 to provide my flock with shade. 2. The pop door in the front of the coop is too large. It swells when it rains making it harder to close at night. 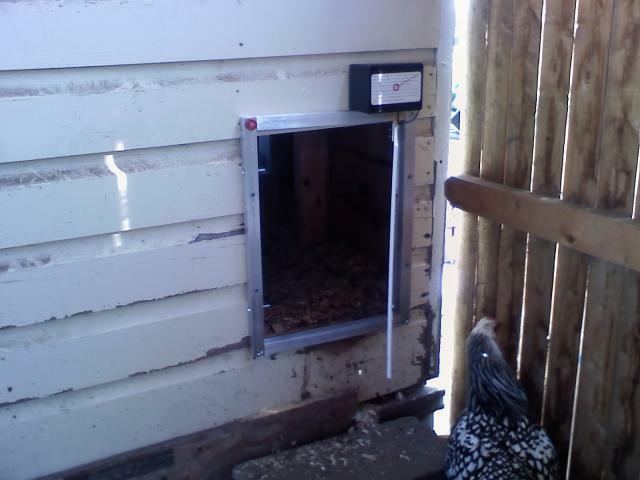 I will be purchasing another Pullet-Shut automatic chicken door to replace it in 2011. "Would love to see the modifications"
Would like to see the shed from beginning through the construction. Your coop and run both look very nice, however, there is not enough information from the pictures ( and none from the text) that shows or tells me how to build this coop and run. I do like that you have reflected on what you would do differently if you were to build it again. 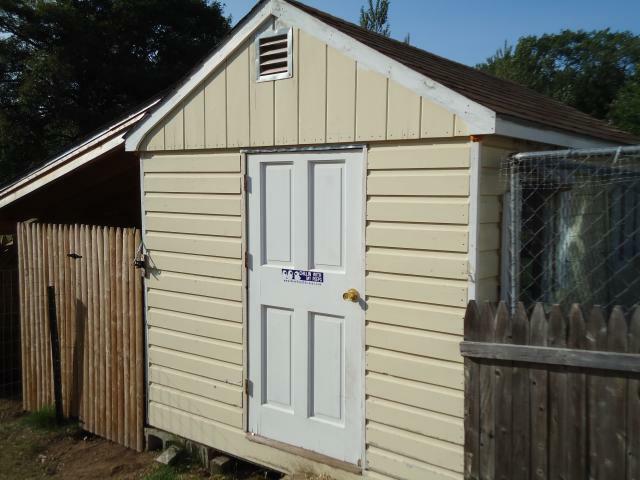 I know that you said this was an 8 x 12 shed, but you could have given a lot of details/information about how/what you modified to transform it into a chicken coop. Also more information about how you built the run(s) that go with it. Thanks for sharing your coop and run with us.